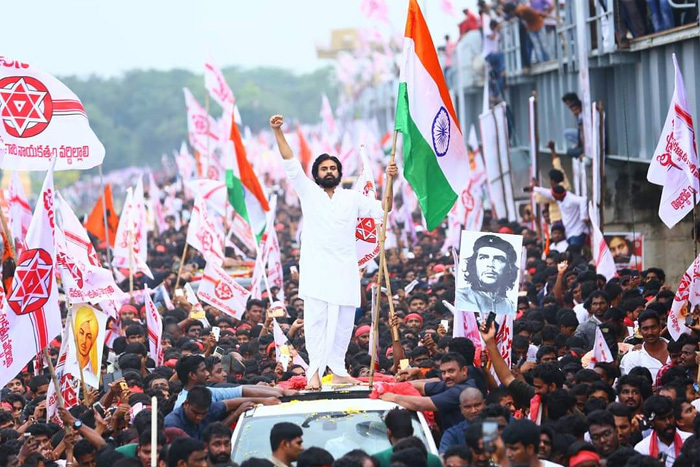 Power Star Pawan Kalyan showed his power in political battle field in Andhra Pradesh yesterday with Jana Sena Kavathu on Dhawaleswaram barrage. All his fans and supporters of Janasena got super excited after hearing the speech of Power Star. However those who heard his speech felt that he copied Super Star Mahesh Babu's powerful dialogues as CM in his blockbuster film Bharat Ane Nenu. Pawan said, “Nenu Ae Pani Chesina Trikharana Shuddhi Tho Chesthanu". These are similar to the words used by Mahesh Babu in Bharat Ane Nenu. Wonder what will be the reaction of Pawan Kalyan and his supporters over copying from Mahesh Babu. However, Janasena Kavathu was a huge success with many of the party supporters taking part in it.